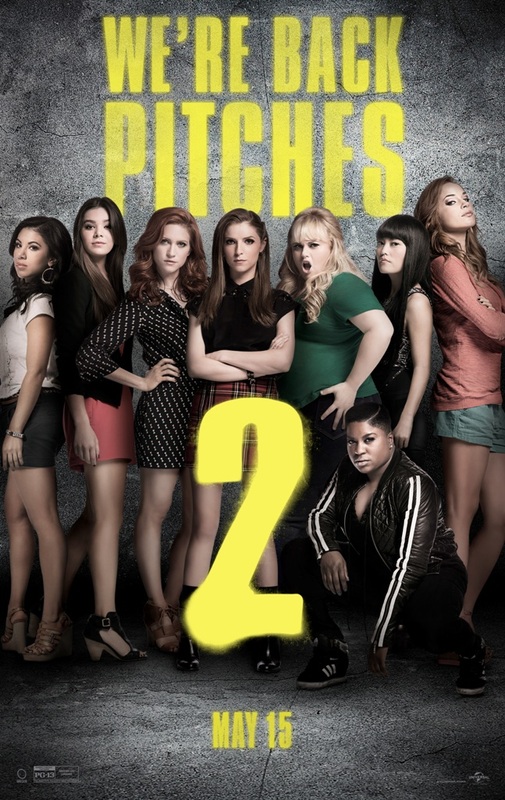 Pitch Perfect 2, directed by Elizabeth Banks who also stars in the film, is the sequel to the break out musical hit from 2012 which was written by Kay Cannon and Mickey Rapkin. The movie stars Anna Kendrick, Rebel Wilson, Hailee Steinfeld, Brittany Snow, Skylar Astin, Adam DeVine, Katey Sagal, Anna Camp, Ben Platt, Alexis Knapp, Hana Mae Lee, Ester Dean, Chrissie Fit, Birgitte Hjort Sørensen, Flula Borg, and John Michael Higgins. The Barden Bellas are back although the mighty have fallen on hard times after an embarrassing Lincoln Center performance has them on the verge of being shut down altogether. 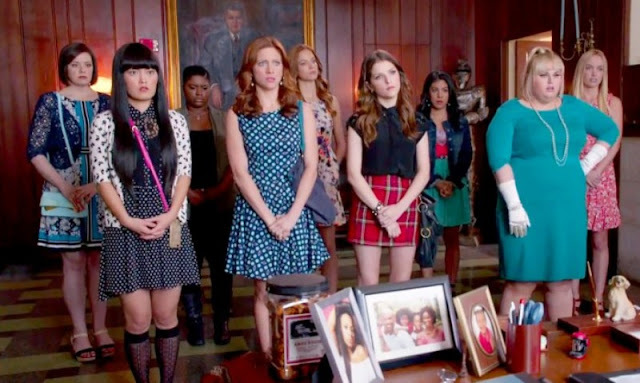 In an effort to keep the squad from being eliminated forever, Beca (Kendrick), Fat Amy (Wilson), newcomer Emily (Steifeld), and the rest of the crew agree to a last stand performance in a world competition that no American team has ever won. As the girls look to regain their mojo, the German a cappela team led by perfectionists Kommissar (Hjort-Sørensen) and Pieter Krämer (Borg) begins to assert their dominance on the field with a series of astounding performances. I'm not sure why, but I have really enjoyed both of these movies and am hoping we get to see more of the Bellas down the road. With Elizabeth Banks taking over as director, the sequel really doesn't miss a beat and definitely stays in tune with what made the first movie such a big hit. The songs are great, the performances are very entertaining, and the story holds together just well enough to keep you from being distracted. I wasn't sure what could be done to raise the stakes this time around, but creating a world competition with a more than formidable opponent like the German squad was the perfect opportunity to put the Bella's in a position to have to raise their own game to new heights. Meanwhile, the ladies are also dealing with a bunch of personal issues of their own that have to be worked through and keeping all the story lines together within the overall narrative is a testament to Banks' ability behind the camera. Speaking of Elizabeth Banks, she once again steal the show alongside John Michael Higgins as the oh so politically incorrect and sarcastically brash commentators. I can only imagine how much fun they must have had filming their scenes together and especially since they need to keep a straight face while doing it. Turning the other direction for a moment, I felt like Anna Kendrick was just sort of breezing through her performance without really showing off that magical star quality she is very much known for although it could be just the material she had to work with so I;m not going to knock her performance too much. The rest of the cast pretty much does what they do although I did feel like they pushed Rebel Wilson's character just a bit too far over the edge at times. It did make for an interesting contrast watching her basically plunge over that fine line that makes or breaks a great comedic scene compared to banks and Higgins who know exactly where they need to land with every bit of dialog they throw out there. 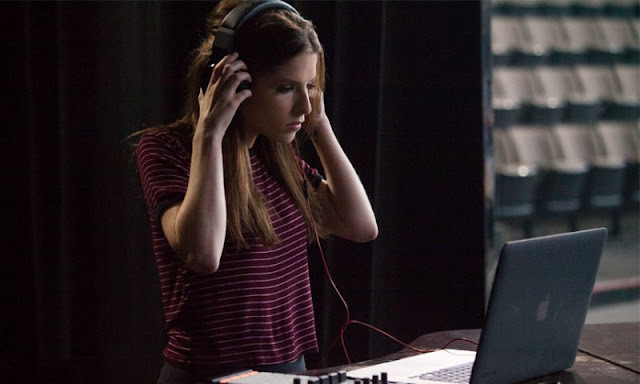 Pitch Perfect 2 is a pitch perfect example of how a sequel can really be made to work as it builds off the success of the original and still manages to give the audience something new. If there was an award for "Most Likable Cast", these fine folks would definitely walk away with the trophy. My one word description for this movie would have to be "fun" as it really is a good time and very entertaining from start to finish. Everest - IMAX or Cinerama?